I had the chance to spend a couple of days visiting author and whisky-aficionado Mark Charan Newton this weekend. We spent some time discussing books, of course, and had an adventure with a group of llamas… but we also got to taste a few whiskies from Mark’s spectacular collection. In the spirit of full confession, it must be said that I’m a bit of a lightweight. So I tried to take notes, but my handwriting (which borders on illegible under the best of circumstances) veered into the utterly incomprehensible after my second or third sip. And I’m (obviously) no connoisseur. Still – let’s see what I had to say! My last whisky of the evening. What I remember is that I liked this one very much. Of course, I was at the point in the evening where I liked everything very much! Anyway, this was a self-filled, valinch-sized bottle named for Andy Murray’s Wimbledon win. Read all about it here. Karuizawa distillery – Spirit of Asama. Bowmore Tempest Batch 3 – 10 years old. One sip and you immediately understand why it’s called ‘alligator.’ Not to put too fine a point on it, but this alligator bites. Oliver Johnson and Iain M. Banks, when searching Islay for ‘the perfect dram’ decided Ardbeg was the closest to it. And there you have it! 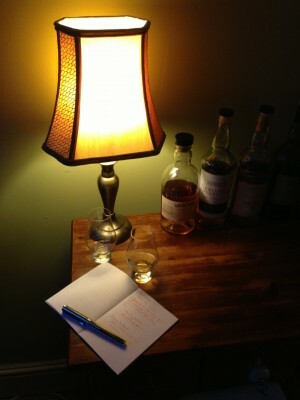 I’m no whisky blogger – or expert, or even pretender – but I certainly enjoyed myself. Of the whiskies listed above, I’d have to say the Alligator was my favourite. What say you? Sweet or peaty? Single-malt or blended? What’s your perfect dram?